Are you happy with your Lexus RX330, but you'd like a little more power--maybe enough to dust off the guy down the street in the Mercedes ML 500. How about a luxury Lexus SUV that goes from 0 to 60 in 7.3 seconds? That's about three-tenths of a second faster than your 330 and puts you on par with your neighbor's ML 500, or 3.4 seconds 30 to 50 mph, a second quicker than competitive vehicles. What if it had 650 lb.ft. of torque at launch, and on top of all that performance, it got about 28 to 30 mpg. No, it's not some kind of super diesel, it's a hybrid-electric SUV. Hybrid isn't just for fuel economy anymore. In fact, Denny Clements, group vice president and general manager, Lexus division, says that the RX400h won't be sold on fuel economy at all. "We're going to market it on the basis of performance, package and quality," says Clements, "and exceed the buyer's expectations on fuel economy." Clements says that research shows the fuel economy is not even on the list when buying luxury SUVs, though it does show up as a post purchase complaint. With an expected average of 28 miles per gallon, fuel mileage should no longer be a factor. At first glance the 400h doesn't look much different from its sister 330. There are three principle differences in the front of the vehicle. The grille was redesigned and an extra cooling inlet was added for the hybrid components, which required a redesign of the front fascia. Round fog lamps replace the rectangular fog lamps of the 330. The changes to the rear of the vehicle are even more subtle. The tail lamps now have horizontal trim pieces and the bulbs have been replaced with LEDs. LEDs use less energy while giving off a brighter light and are also a lot more durable than incandescent bulbs, requiring less maintenance. The extra cooling inlet in front caused an addition in drag that needed to be offset. Fairings were installed behind the front and rear wheels to split up the airflow coming off the tires. Some new underbody shields were also added to the vehicle. These tweaks brought the coefficient of drag back in line with the RX330. Interior differences consist of brushed-aluminum inserts replacing the wood inserts on the 330 and a modified IP cluster that replaces the tachometer with a power meter. This RX400h rides on specific 18-in. by 7-in. aluminum wheels fitted with P235/55R 18-in. tires. Lexus chose not to go with rolling resistance tires. Because of the vehicle's power and performance characteristics, it was felt that the vehicle needed sufficient rubber underneath it and a rolling resistant tire would have been too much of a compromise. The 400h has front struts with internal rebound springs and linear control valves, tuned for sportier handling. In the active safety area, the 400h's Electronically Controlled Braking (ECB) system combines the regenerative braking of a hybrid vehicle with the cooperative hydraulic braking system into what is essentially a brake-by-wire system. ECB becomes an integral component of both the powertrain system and the handling system. The RX400h is equipped with Vehicle Dynamics Integrated Management (VDIM). VDIM is a proactive stability control system that anticipates vehicle instability in virtually any direction. The system integrates a yaw rate sensor, deceleration sensor, speed sensor and steering sensor that send data to the Electronically Controlled Braking system (ECB). The ECB system translates brake stroke speed and pressure and generates the precise amount of combined electric regeneration and hydraulic pressure needed for virtually any driving condition. VDIM interfaces with the ABS, brake assist, vehicle stability control and traction control, allowing more precise control of these systems. It also uses a new electronic power steering system to optimize steering assist. The system uses a 42 VDC electric motor, wrapped around the rack Power is supplied by a DC/DC converter. An additional sensor has been added to the vehicle that senses both side collision and rollover due to side collision, and triggers the front and rear side curtain airbags. Modifications have also been made to the body reinforcements and structural geometry to account for the additional 300 pounds of mass in the event of a collision. Several NVH improvements were made to the 400h. The extra weight, extra torque and improved handling characteristics required additional torsional rigidity. Several gussets and reinforcements were added to stiffen up the body. The windshield is made of an acoustic damping laminated glass to keep out unwanted noise when the engine is shut off at rest. The cooling fan blade tips and shroud were redesigned to reduce the noise signature and keep it from being transmitted into the cabin. The 400h also uses direct gear drive on the front transaxle, which further reduces noise. The 400h uses the same 3MZ-FE 3.3L 24-valve, V-6 engine that's found in the RX330. It puts out 208 hp, about 10 percent less than the 330 due primarily to changes in the intake and exhaust systems for hybridization. The engine uses the Otto cycle instead of the Atkinson cycle--another conscious decision on Lexus' part to lean more toward performance. It has electronic throttle control, calibrated specifically for the hybrid application, and the variable valve timing has been tuned to facilitate hybrid operation. Starting the engine when the vehicle is moving can create an undesirable noise, so the intake valve timing has been adjusted to create a later dosing which allows the engine to start while making less power, reducing the NVH spike. The 400h doesn't use the acoustic control intake system from the 330 as the vehicle gets the majority of its initial torque from the electric motor. Losing the acoustic intake also made space for the power electronics. The hybrid V-6 has no external starter or alternator and no serpentine belt, which not only deans up the package but reduces the parasitic losses of a beat system. Because the engine is frequently off, the 400h uses an electric power steering system. This vehicle uses an electric A/C compressor because with a conventional compressor the engine would need to run just to keep the cabin cool, reducing fuel economy. The electric A/C compressor is slightly different than Prius'. The electric inverter is mounted inside the compressor itself. DC voltage is sent to the compressor and the onboard converter supplies AC to the system. It also has an electric water pump to pump block water to the heater core during engine-off operation in winter to provide heat to the cabin. On the intake side of the system there is a charcoal dement that reduces the trapped vapors during engine shutdown to achieve a zero evaporation compliance. There is a higher cell density catalytic converter system on the exhaust side which enables the vehicle to reach SULEV tailpipe emissions. The vehicle is certified SULEV in California and meets the Federal standards for Tier 2 Bin 3. Unlike Prius, which uses a hot water bottle to heat the intake manifold, the 400h has a different cold-start emission device that delays the start while it preheats the air/fuel ratio sensors. This allows the air/fuel ratio sensors to be active when the engine does start, reducing cold-start emissions. There is no need to wait on the engine as there is plenty of electric juice to launch the vehicle. The hybrid transaxle is a three-shaft configuration (as opposed to the Prius' four-shaft transaxle), which results in a more compact size with reduced noise. The system uses two water/oil-cooled permanent magnet electric motors designated MG1 and MG2 and two planetary gear sets. The direct gear-drive transaxle uses no clutches, bands, valves, hydraulics, linear actuators or any of the parts generally associated with either an automatic transmission or band- or belt-type CVT. It has a final drive ration of 3.543:1 and weighs 236 pounds, about 26 pounds more than the five-speed automatic in the RX330. While 26 pounds may seem like a lot, if the Prius transaxle was scaled up to handle the level of power made by the 400h, it would be significantly bigger. MG1 is principally the generator but it also serves as the starter for the engine and the control function of the electronic CVT. It provides 109 kW at 13,000 rpm (146 hp). MG2 serves as the motor, except under braking when it becomes a generator. It provides 123 kW at 4,500 rpm (165 hp) and 355 Nm (262 lb.ft.) of peak torque at 0-1,500 rpm. That's even more impressive when you realize that it's multiplied by nearly two-and-a-half before it's delivered to the final drive. The transaxle uses two planetary gear sets. The Power-Split unit divides engine output to drive the wheels and MG1, the generator. The Motor Speed Reduction planetary reduces MG2's 12,500 max rpm to a more useable final gear ratio of 2.478:1. "Mechanically, this transmission is very simple, much simpler than any other transmission out there. It is a really elegant way to get variable gear ratios without having to have a lot of extra pieces in the box," says Dave Hermance, executive engineer, environmental engineer, Toyota Technical Center. The 400h's innovative, optional all-wheel-drive system uses an additional electric motor to drive the rear wheels and can electronically vary torque front to rear (up to all available torque to the rear), when extra traction is needed. The rear motor can also send up to 650 lb.ft, of torque to the rear wheels, providing V8-type acceleration. The rear transaxle is also a three shaft configuration with one motor/generator and no planetary gears. It is also direct drive and uses no clutches, bands or hydraulics with a 6.86:1 gear ratio and a total weight of 90 pounds, still less than the weight of the rear axle on a four-wheel-drive RX330. The system isn't as complex as a conventional 4WD system because it doesn't include the propeller shaft and support bearings, just three wires going back to the control box. The rear drive motor is air/oil cooled as it would be expensive to route water lines to the rear of the vehicle and makes 50 kW (67 hp) and 96 lb.ft. of torque from 0 to 610 rpm. The power electronics sit over the top of the front transaxle and include a system to convert high-voltage DC into three-phase AC for the three electric motors. It is controlled by the hybrid ECU and has a boost converter which is a characteristic of all the Hybrid Synergy Drive systems. This particular system increases pack voltage from 288 VDC to a system-operating voltage of 650 VDC. (Prius is 202 to 500). Use of this higher voltage holds the currents down while still making lots of power, reducing the cost of the electronics. The DC/DC converter converts 288 VDC to 12 VDC to run the auxiliary systems. It shares the cooling system with MG1 and MG2 and is integrated into two stacked radiator systems in the front of the vehicle. The motor/generator ECU is now packaged inside the inverter, reducing one set of inter-connectors, simplifying the system, The electronics package weighs 70 lb. There is a separate 12V battery that's used to wake up the computer. When the system is in the key-off position, the system main relay opens and separates the high-voltage system from the rest of the vehicle. The 12V battery is needed to bring the computer up to energize the system main relay. The battery pack is the latest-generation NiMH battery. It contains 30 modules with a pack voltage of 288 VDC nominal. Each module is eight individual cells creating 9.6 VDC with a peak power of 85 kW, an increase of 80 percent over the Prius. The metal case improves heat rejection and reduces the size of the height of the battery by 22 percent, allowing it to be packaged under the rear seat, while only increasing the rear seat H-point by 1 in. The modules are split into three sections to accommodate the support rails of the 40/20/40 split folding rear seat. Each module has its own independently variable cooling system The 150 pound battery pack includes the battery ECU, system main relay and service plug. The 400h uses a fourth generation hybrid ECU that includes all of the engine ECU functions, simplifying the interconnection installations and reducing cost. A CAN-bus is used for all of the system's high-speed communications. The electric all-wheal-drive system is principally an on-road traction enhancer. Its primary job is to manage the large amount of torque produced by the system and also to ensure superior performance in slick and wet conditions. It was not designed to be an off-mad system It has a variable front/rear torque drive ratio of essentially 30 percent to the rear, on dry surfaces. Under slick conditions, all of the available torque can be delivered to the rear axle. Traction control is improved because it's much faster to control an electrical motor than either modulate the brakes or throttle in a conventional traction control system It also allows for four-wheal regenerative recapture and is managed by VDIM system. A dosed-loop fuel system replaces the bladder tank used in the Prius. The system allows no flow path for the vapors to get out of the tank when the engine is turned off, using a tank closing valve that sits on top of the tank outlet and doses the system from the vent standpoint anytime the engine is off, both at rest and idle stop. The evap canister is only used for refueling. In order to accommodate the extra pressures, the tank material has been increased to 2.0 mm from 0.8 mm. Refueling the 400h requires several steps as the vapors need to be bled from the system before the cap can be opened When the cap is released from inside the vehicle, it actuates an electric solenoid on the electronic fuel door. A series of messages come up on the IP, letting the driver know when it is safe to refuel. The tank holds 17.2 gallons and has a direct-read fuel gauge. The hybrid Lexus is built similar to the Prius. It will use the same basis body-in-white as the RX330 with modifications to the floor pan to accommodate placement of the battery beneath the rear seat. Both the IP and ECU are built on a sub line off the main assembly line. Like most Toyota vehicles, the powertrain is brought in on a rolling cart and bolted into place, so sequencing in the hybrid drivetrain doesn't require any extra steps. The only extra assembly step needed is the installation of the battery. The decision to do the hybrid Lexus was made before the second generation Prius was launched. The RX was picked because Lexus felt that it would be easier to integrate the hybrid drivetrain into an SUV. And it would also offer engineers a chance to learn how to adapt Hybrid Synergy Drive to existing platforms. The eCVT transmission is reasonably adaptable to any Toyota or Lexus engine as it's not much bigger than the company's five-speed automatic. Toyota says the system would be a natural for an all-wheal-drive Sienna minivan. "We're getting to the point," says Dave Hermance, "Where integration will be primarily software development." 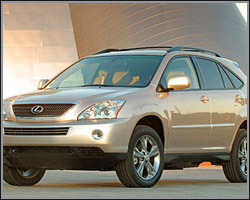 The 400h will goes on sale April 15, 2005, and Lexus has already received more than 9,000 pre-sold orders through its website. Clements says that each 400h will be built to order at Toyota's Kyushu, Japan, plant where it will be built alongside the RX330 (Harrier in Japan) and Toyota Highlander (Kluger). A hybrid version of the Toyota Highlander, which shares the same platform as the RX330, will begin production in March. While demand for hybrids is high in North America and the introduction of the 400h pushed back several months to allow the plant to ramp up production before hunch, Clements still doesn't see the 400h taking off like the Prius. "With the fairly robust premium (about $4,500) we don't see them selling 10,000 a month," Clements says. "We'll try to meet demand and if the demand isn't there, we won't build them." Build-to-order won't be that difficult, as Clements says the 400h doesn't have a lot of options to choose from. "Customers can just come in and pick color."